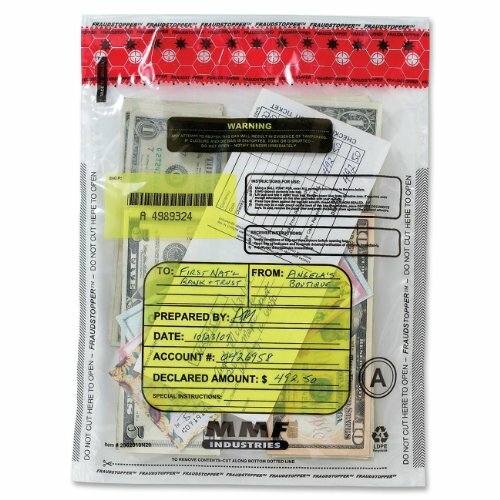 Each MMF Industries 2362010N20 FraudStopper Tamper-Evident Deposit Bag is made of a durable, co-extruded polyethylene film that is water and tear-resistant to withstand rough treatment and keep deposits intact. A writable form on the front of the bag allows the user declare the sender and receiver, prepared by, total and date. Each bag includes an alphanumeric number, bar code and receipt for internal tracking. A permanent adhesive seal on the top of the bag guarantees that the contents remain intact and will display the word void when tampered with. The bags feature strong side-weld seams to prevent splitting on the seams. Available in a box of 100 bags, MMF Industries Tamper-Evident Bags are an economical choice in secure deposit enclosures. 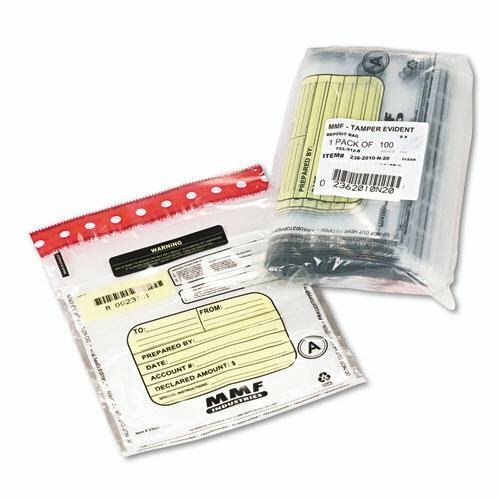 MMF Industries offers customers a full array of office and banking products. Produced in the USA and overseas, MMF products offer the consistency and reliability that keep customers coming back. Self-sealing adhesive closure has security features that exceed bank requirements for levels of tampering evidence. Security seal will display amp;quot;VOIDamp;quot; message and rip if exposed to extreme cold. Blue dots will appear on security seal when exposed to heat. Stars on seal distort if bag is exposed to chemicals, solvents or saliva. Microprint fades and distorts if seams are broken and resealed. Alphanumeric coding, bar code and tear-off receipt provide audit tracking. Small to medium-sized deposits. Width: 9amp;quot; Colors: Clear Height: 12amp;quot; Materials: Polyethylene. Self-sealing adhesive closure has security features that exceed bank requirements for levels of tampering evidence. Security seal will display "VOID" message and rip if exposed to extreme cold. Blue dots will appear on security seal when exposed to heat. Stars on seal distort if bag is exposed to chemicals, solvents or saliva. Microprint fades and distorts if seams are broken and resealed. Alphanumeric coding, bar code and tear-off receipt provide audit tracking. Marketing Information: Designed to minimize fraud and loss during cash transfers, these Tamper-Evident Deposit Bags are made of a co-extruded recyclable plastic to prevent puncturing or tearing. The bottom of the bag is folded, not sealed, to further prevent unlawful entry into the bag. In addition to the strong side and bottom seams, this bag features tamper indicators to prevent fraud. 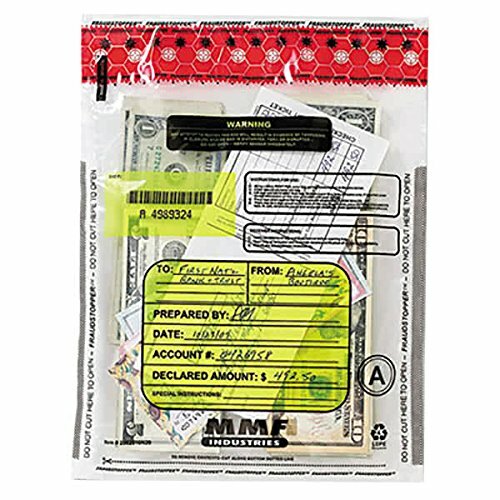 The clear bag also features a yellow shaded area for notations, unique alphanumeric numbering to ensure tracking and prevent thieves from replacing the bag, and a bar code for scanning. Brand Name: MMF Manufacturer: MMF Industries Manufacturer Part Number: 2362010N20 Packaged Quantity: 100 / Box Product Line: Tamper Evident Product Name: Tamper-Evident Deposit Bag Product Type: Currency Bag Assembly Required: No Certifications & Standards: ASTM Country of Origin: Canada Green Compliant: Yes Post-consumer-waste%: 0% Recycled: No Recycled Content: 0% Color: Clear Material: Plastic Application/Usage: Deposit Bag Length: 12" Bag Width: 9"
Easily deposit checks, currency, and cash with this TableTop King 2362010N20 clear 9" x 12" tamper-evident cash deposit bag! These bags feature Level 4 security, the most sophisticated tamper-evident technology available! They cannot be bypassed by heat, cold, saliva, tears, punctures, or cuts. The bags are specially coded alphanumerically with tear-off receipts, and leave plenty of space for transmittal information to be logged. Ideal for small to medium deposits, this cash bag is great for offices, universities, banks, and other commercial establishments.A clear, see-through design lets you easily identify the contents in the bag. And, it's 100% recyclable! With this bag, you can feel confident in your financial safeguarding practices. Looking for more 2362010n20 Tamper similar ideas? Try to explore these searches: Tiger Woods Nike, Black Multi Pen, and Angels Buckle.